In 1982 Dire Straits recorded their Love over Gold album in New York. 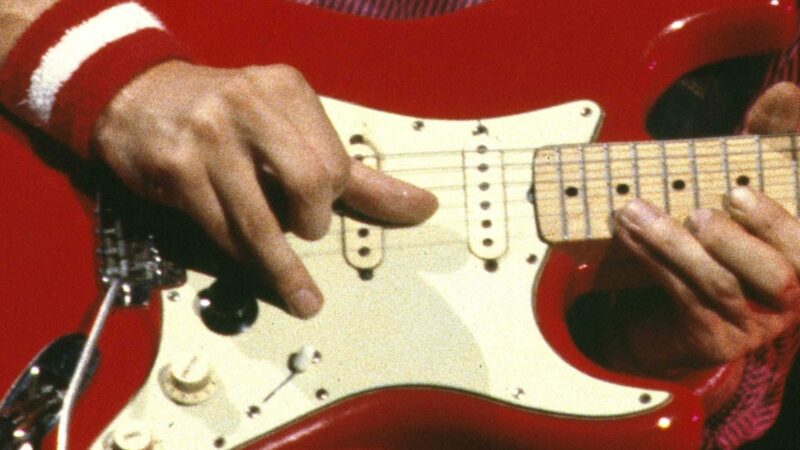 According to Knopfler himself, he spent some time before with learning new chords and licks from a book by Mickey Baker. This circumstance, and the collaboration with Jazz musicians of the New York jazz scene – like Mike Mainierei, Michael & Randy Brecker or Tony Levin – seem to be the reason why sudenly more jazz elements appeared in his playing. A short time later Knopfler recorded the Local Hero soundtrack, again some of these musicians appeared on tracks like Smooching. In 1984 the soundtrack for Comfort & Joy was released. The licks in the following video are from this 3-track soundtrack – from the track Joy (orginally released on a maxi vinyl single). They illustrate Knopfler’s jazzy approach -typical elements are chromatic notes, e.g. using the b5 note of the scale, or the swing rhythm. I have not heard the soundtrack for years I must admit, and generally I do not care too much about playing 100% authentically, I rather try to catch the feel and play it the way it sounds good to me, so forgive me if some details are not accurate. Nevertheless the video should give you some insight of what is going on.